PISCATAWAY, N.J. (September 20, 2017) ― Calling for increased support for apprenticeship programs in the building and construction industry, LIXIL Americas President and CEO Steven Delarge met with key federal officials on September 14, 2017 at the White House. Organized by the American Supply Association (ASA) and Plumbing, Heating & Cooling Contractors Association (PHCC), Delarge joined other industry leaders at this meeting attended by representatives from the Department of Education and the Department of Labor. LIXIL Americas, the global business unit under which plumbing brands American Standard, DXV and GROHE operate, was joined with representatives from other ASA-member and PHCC-member firms, including Win Supply. The meeting focused on Executive Order 13801 – entitled “Expanding Apprenticeships in America” – signed by President Donald Trump earlier this year to promote effective and affordable workforce development programs and apprenticeships. The Executive Order sought support from the private sector versus using taxpayer dollars. Create a national plumbing license, rather than individual state licenses, to establish uniformity, simplify training, and encourage portability across state lines for employment opportunities. 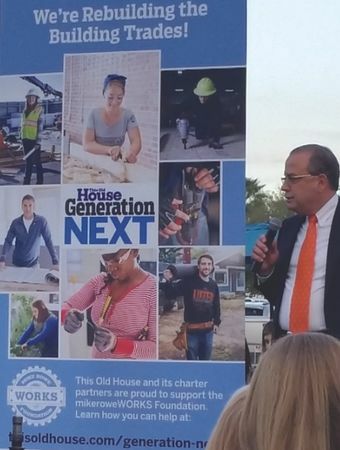 Encouraging careers in the skilled trades, LIXIL Americas is a founding sponsor of the Generation Next program spearheaded by This Old House. This philanthropic initiative raises money from companies and trade groups in the building and construction industry to provide scholarships for students pursuing careers as plumbers, electricians, carpenters, roofers, masons and other skilled professions. Additionally, the New Jersey-headquartered LIXIL Americas provides training and career mentoring to high school and adult vocational education programs throughout its home state. This initiative includes tours of its research and design center in Piscataway, N.J., as well as product donations to upgrade training facilities.at local schools. Skilled plumbers, contractors and builders are also provided with product usage training, with a focus on commercial fixtures and faucets, plus a tour of the Company’s product development and testing facilities.